As Thursday’s 4 pm non-waiver trade deadline looms, the majority of MLB clubs are slapped with one of two labels: buyers or sellers. Either your team is cashing in any or all chips in hopes of competing immediately, or your team is acquiring pieces that hopefully will improve the team in the future in exchange for some everyday players. Of course, teams are not obligated to participate in the madness. You can stay the course, hoping the team you’ve put together so far is capable of achieving whatever goals your franchise has set. Heading into the All-Star break, the Cincinnati Reds should have been buyers. They had won seven of nine games and were in the thick of a hotly contested battle in the NL Central. Maybe they could have added a bat or two to make up for their injured stars, perhaps a pitcher to solidify their bullpen. Since the Reds have a mediocre farm system—one top pitching prospect in Robert Stephenson and a few solid outfield prospects—a deal for a star would have been difficult to construct without giving up some of their big-league talent. Still, I was confident that Walt Jocketty would conjure some deal that gives the Reds a shot to compete this year. Then the All-Star break happened, stomping out the team’s momentum like a cattle rancher stomping on a cow pie. (That analogy courtesy of Jeff Brantley, at some point or another.) The Reds spiraled into a stretch of offensive futility. The post-All-Star-break Reds have been an episode of The Leftovers—sad, lifeless with seemingly no hope of ever finding happiness again. Before Wednesday afternoon’s scoring explosion (a 5-4 loss to the Diamondbacks), the Reds had scored 3 runs or fewer in 11 straight games. The longest such streak in the past 30 years is 12, which the Reds would have reached if not for Devin Mesoraco’s home run with two outs in the ninth inning yesterday. Of those 16 freezing-cold teams, the 2014 Reds had the lowest batting average (.176), most strikeouts (100), and fewest walks (18). As of Thursday, July 31, the Reds have lost 10 of their last 12 and sit in fourth place in the NL Central, 5 games out of first. And even worse than the troubling numbers during this streak was an overwhelming sense of ennui in every at-bat. The mounting losses increased pressure, and it seemed to visibly weigh on everyone. Extra-base hits turned into novelty toys. Each run-allowed created a new peak to ascend. The team seemed exhausted. Jay Bruce was cloaked in all his Bruce-ian glory, resigned to striking out nearly every time he stepped up to the plate. (This resulted in three hits to go along with 15 strikeouts in 32 at-bats during the streak.) Even the reliable Todd Frazier wasn’t much better, totaling 8 hits in 43 at-bats. After a stretch like that, viewing the Reds as anything but sellers at the trade deadline would be naïve. This is not a team that is a hitter or two away. It is a team bereft of hitting and decimated by injuries. Dumping the few promising prospects for potentially one-and-a-half years and around $18 million of Alex Rios, or two-and-a-half years and around $19 million of Marlon Byrd, is not a smart decision. The most likely scenario for the Reds is that they will stand pat and appear competitive while quietly thinking, We’ll get ‘em next year. But that’s boring, devoid of imagination and doesn’t make much sense. The Reds should be looking to make a move, to re-stock their farm system. The team has a few assets available that would demand a considerable haul. Aroldis Chapman is a breathtaking pitcher, but he’s also a closer and thusly replaceable. If the Reds could find a team enthralled by the 100-plus MPH pitches enough to overpay, they should at least listen to offers. If a team is looking for an outfielder that is not particularly good at baseball anymore, Ryan Ludwick should be available. It may be worth seeing if they can cash in on Alfredo Simon’s career year. But the one player the Reds should absolutely be looking to trade is Johnny Cueto. The Reds ace is in the middle of a career year. He is on pace for career bests in ERA (2.08), WHIP (0.93), K/9 (9.08), and nearly every other statistical category. His fastball velocity is up to an average of 92.9 MPH, the highest since 2010. Since June, he’s allowed more than three runs in a start just once. His value has never been higher, statistically speaking. 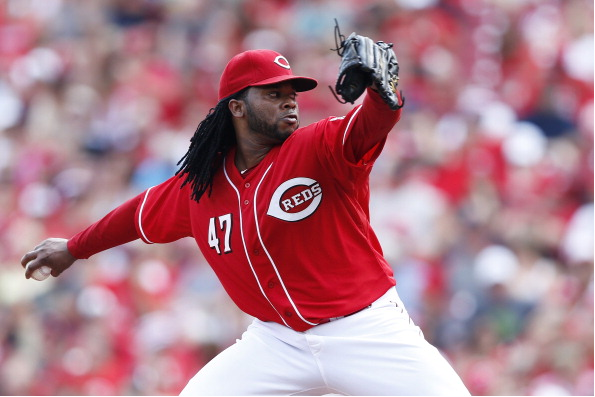 With that level of production, the Reds could put a very high price tag on Cueto. According to Pittsburgh Pirates beat writer Travis Sawchik, a “sensible” price for Jon Lester (who would just be a rental for the remainder of this season and is comparable statistically to Cueto) would be prospects Josh Bell, Nick Kingham, and Jacoby Jones. In other words, that sensible price is two top 100 overall prospects—top 50 according to some publications—plus another top 20 prospect in the organization. If the Reds dangled Cueto, they would most certainly get a prospect haul at least as good and probably better, perhaps even securing a team’s top prospect. Cueto’s name has not surfaced at all amid the bevy of rumors circulating, likely because the Reds are not actively shopping him. But at the right price, Cueto should be made available for one main reason: the Reds cannot afford him. After 2015, Cueto will be an unrestricted free agent and command far more money on the open market than the Reds can spend. Cueto’s next contract will likely be more than the six-year, $105-million deal that the Reds gave Homer Bailey this season. Add that to the fact that the Reds also have to consider paying Mat Latos—not to mention that Joey Votto is in the first year of an increasingly unappealing 10-year, $225 million contract extension—and it becomes clear that Cueto is the odd man out. There is no chance of the Reds having three $100-plus million contracts on the books at the same time. Sure, Cincinnati could always trade him next year around this time, or let him walk in free agency. But trading him now would maximize the team’s return. And unless Cueto can secretly play left field and hit .300, the Reds aren’t going anywhere this year, regardless of how well he pitches.